Many engineering wonders dot the world from the Egyptian Pyramids to China’s long Wall. The United States has been a part of two major engineering feats that are a testament to man’s apparent mastery over nature. One was accomplished outside the country in Panama with the plan to bring together two oceans and the other in a desert with the goal of taming the Colorado River. The Panama Canal engineers had to deal deadly Malaria disease transported by mosquitos, making their jobs more difficult. 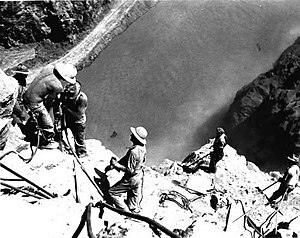 The Boulder Dam project engineers figured out how to divert a river so they could excavate and pour millions of cubic feet of concrete. Each project had their own challenges and issues but were overcome so that economies and cultures could make a step forward. Benefit to US: National Security, Shipping Lanes Benefit to US: Hydro-power to several arid states in the region. The Hoover Dam’s main controversy was the name itself. As usual, politics entered into the equation when at the dedication speaker Secretary of the Interior Harold Ickes spoke the name “Boulder Dam” five times in a span of 30 seconds to force home the moniker. Former President Hoover who helped marshal the construction plans through the political process wasn’t invited to the ceremony. Later, after Hoover had completed many important projects after his Presidency thereby rehabilitating himself and his name, both houses in Congress passed a bill unanimously that officially renamed the dam, “Hoover Dam”. Other than the naming controversy, the engineering plans and worker skill served the day to the project completed ahead of schedule. Workers had a competition for what shift could excavate the most dirt and rock. This friendly competition moved the project along. 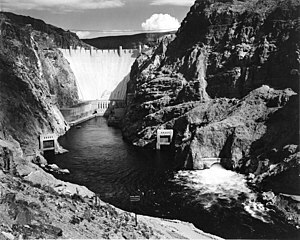 Hoover Dam has provided much-needed power and irrigation to the southwest region of the United States. In recent years, traffic has been rerouted to the four-lane Hoover Dam Bypass and Mike O’Callaghan–Pat Tillman Memorial Bridge. With this development, officials have stopped vehicle traffic from crossing the top of the dam. 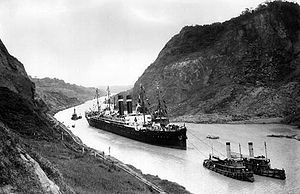 The Panama Canal was built by American engineers and workers travelling to Panama to participate in the construction. The French gave up the project in 1889 after several issues hindered their progress towards completion of the canal. The United States bought the rights to the project and equipment to finish the canal for 30 million dollars. A high price for early 20th century dollar values. Challenges still faced the United States effort. Medical officers had to eradicate the mosquito population that transferred malaria and other tropical diseases. In addition, engineers developed the lock system to get ships from the one ocean over a land crest and down the other side to the other ocean. The United States succeeded in completing the canal and was given control by Panama to run the canal for many years because the United States supported their independence efforts from Columbia. However, the political winds changed and Panamanian support to retake control of the canal began to grow in the 70s. This resulted in President Jimmy Carter negotiating the Panama Canal Treaty that gradually gave control to the host country Panama. Today the Panama Canal provides millions of dollars to the Panamanian National Treasury. Two engineering monuments to human kinds ability to manipulate nature to achieve the desired result. They are also existing structures that remind people that human sacrifice takes many forms. Although cultures and educated engineers are lauded for their towering accomplishments, it is also wise and appropriate to pause and remember the worker who braved daily dangers so that a family could be fed or one’s survival could be maintained. Some lived to tell their story, others didn’t. Reblogged this on Latin People News.